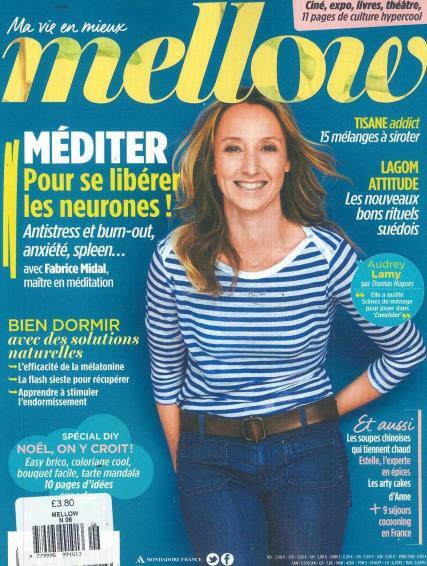 Mellow is a triannual, French, lifestyle magazine, it advocates disconnection for women who work between stress. Mellow is focused on targeting a generation of 30-50 year old women who wish to be more engaged in their daily life. Buy a single issue or subscription of Mellow magazine. Perfect for those who want to escape the digital allowing them to disconnect and live their lives to the fullest. Designed for those who want to escape the digital world yet also want to eat healthy, reconnect and accomplish themselves. It is articulated in six main parts: ‘Take care of me and others’, ‘Take time’, ‘Escape’, ‘Recharge’, ‘Contemplate’ and ‘Organise’.